Doors open at 6 pm with seating starting at the same time. All online reservations are guaranteed seats and any remaining tickets will be sold at the door the night of the event. Hosted by Andrew Brunello and Nate Garvin. The Western Oregon Comedy Competition had a great first round at The MAC Club in McMinnville, OR. 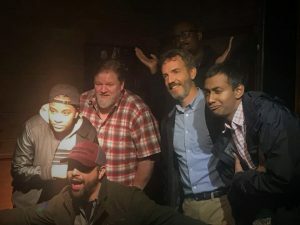 On the night of Oct 14, a sellout crowd watched as 14 comics competed for a spot in the second round and a shot at WOCC 2017 Crown (which is actually just a trophy). After a great show, the audience voted and got to decide who they wanted to see more next round. After tallying up all the ballots, the six comics that advanced are Mike Lindsey (Newberg), Darin Thompson (Salem), Shrista Tyree (Portland), Cody Parr (Bend), Neeraj Srinivasan (Portland) and the top vote-receiving comedian, Carter (Portland). The next round of the Western Oregon Comedy Competition is on November 18th at The Mac Club, 2223 NE McDaniel Lane, McMinnville, OR. Showtime is promptly at 7 PM with seating beginning at 6 PM. For tickets, visit WOCC.BPT.ME or check out the WOCC Facebook Event for more information.